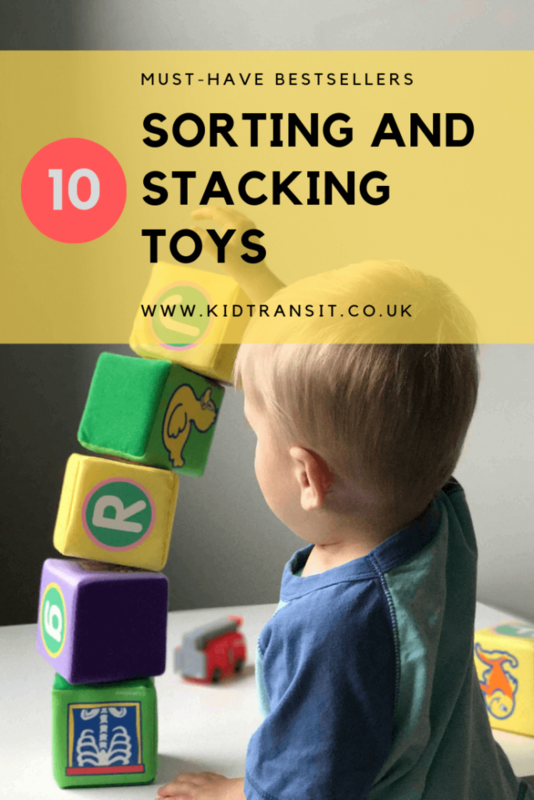 This week’s top 10 is all about toys- especially fun sorting, stacking and plugging toys that get your baby having fun while developing problem solving and dexterity skills. These colourful and safe toys come from loads of different companies so the Amazon bestseller list is the quickest way to find out what other customers rate the best of the bunch. 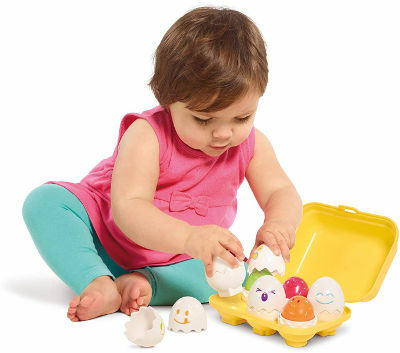 The Hide ‘N’ Squeak Egss all come in a cute little egg box for easy storage. Each egg has a different character face and colour to match with the colour of the egg. Press each egg to get a ‘cheep cheep’. 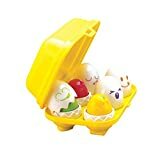 The eggs are also shape sorters: once they are out of the egg box, each egg has it’s own shape to fit back in. 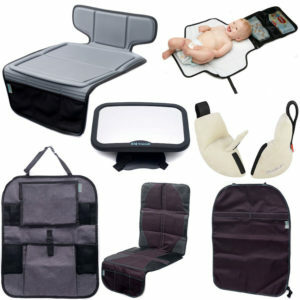 Loads of ways to play with them to keep your baby entertained for ages. Sometimes the simplest toys are the best for your little ones. This pop-up toy from Galt Toys is four brightly coloured ‘people’ that go into a stand with hidden springs so they bob up and down. 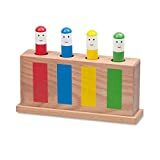 Encouraging colour recognition and matching as well as cause and effect development and motor skills, this wooden toy is a classic that will last well. 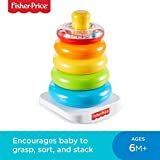 Another great classic stacking toy that all babies absolutely love to play with. 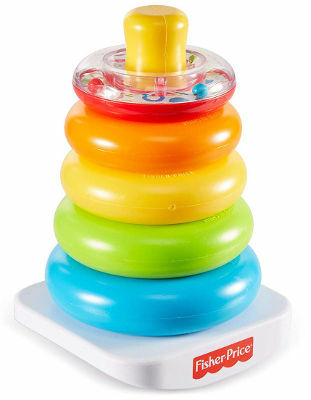 Suitable from 6 months onwards, the toy has five soft, plastic rings that stack on top of each other to make a tower. The smallest ring also doubles as a rattle for extra play options. 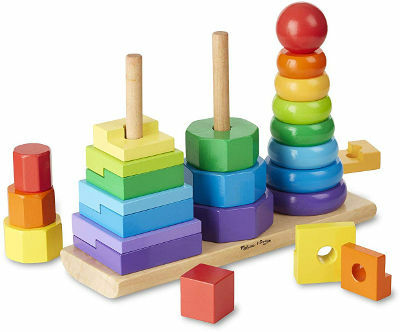 Teaching colour recognition, sorting, fine motor and sensory play development, this stacking is a great purchase. 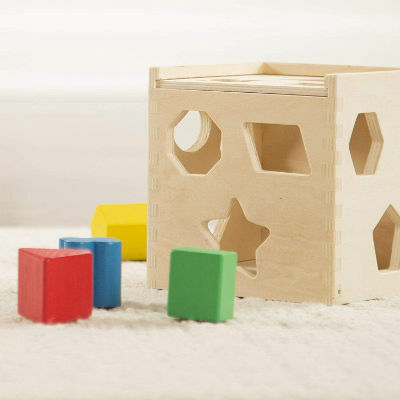 This solidly-made wooden toy is a perfect first shape sorter for your child. 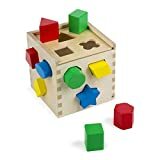 Great for toddlers, the toy has 12 shapes for your child to place through the right holes into the wooden cube. As well as being a shape-sorter, the shapes can also be used as stacking blocks to make towers and develop dexterity. 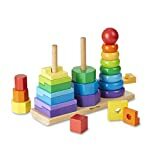 CREATIVE SORTING GAME FOR KIDS: The Melissa & Doug Shape-Sorting Cube Classic Wooden Toy is a beautifully constructed wooden toy with 12 bright-coloured, easy-to-grip shapes. This lovely wooden stacker toy from renowned toy company Melissa & Doug offers a lot more than the classic one tower stacker. The multi geometric toy has three poles to stack the different shaped wooden pieces onto, each shape slightly more difficult to stack. As well as the classic ring shape stacker, there is also octagons and squares that need to be matched and stacks. All the pieces can be arranged into any type of pattern and used for tower, house, castle building depending on how far your child’s imagination takes them. 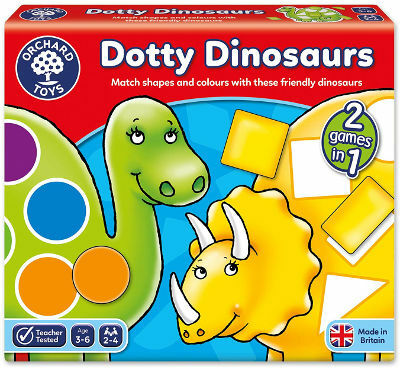 This is a really fun shape and colour matching game from the leading name of Orchard Toys. 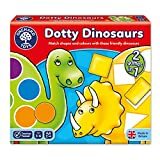 Pick a dinosaur and then roll your dice to pick up the right colours and shapes to complete them. While having fun your child is learning important colour and shape identifying skills as well as about turn taking and how to approach winning or losing with good grace. 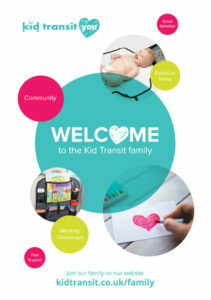 Improve your child’s minor motor skills with these fun transport shapes to lace. Four different shapes including a boat, aeroplane, car and train and lots of different coloured laces to get your child stitching patterns. 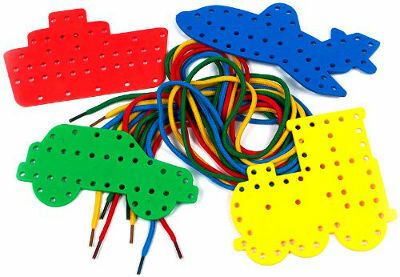 A great toy for a long car or plane journey to keep them occupied for hours. 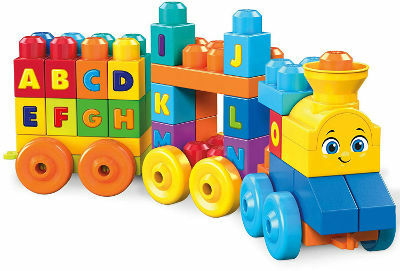 The Alphabet Train from Mega Bloks will give hours of fun for your little one. The blocks are large enough for toddlers to enjoy and the added musical extras will give them lots of play options. The blocks are in lots of vibrant colours with all the letters of the alphabet to support learning. You can just use this as a train to pull along the floor when your child has finished building. The blocks are compatible with other Mega Bloks sets so you can expand the fun with each purchase. 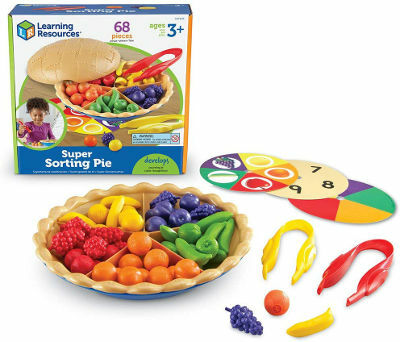 This super sorting pie looks so much fun, I would love to get my hands on one! 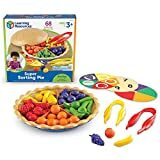 The pie is divided into five different slices and comes complete with five different coloured fruits to put into the different sections using the tongs provided. The fruits can be sorted by colour or type and the tongs encourage fine motor skills. Counting and sorting as well as sharing are some of the skills developed with the Super Sorting Pie. Only recommended for 3 years and up due to the small parts. Stacking and nesting cups are a great toy as they encourage so many skills. From tower building to sorting, number and colour recognition, counting, sensory development, you name it these will deliver! The cups can be used in loads of different situations as well- in the bath to pour and fill with water or at the beach for sandcastle building are just two examples. They are a great toy to take with you when visiting friends and family as the nest easily into the biggest bucket which can be carried and stored quickly. Brightly colored cups stack together. 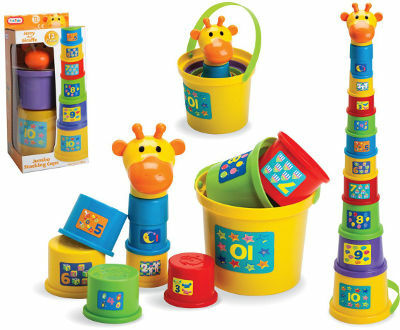 Stack to over 75 cm, includes: Stacking learning cups with shape sorter and a storage bucket with carry handle.